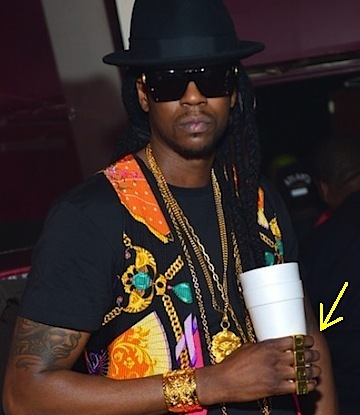 2 Chainz, an up-and-comer known for his guest raps on songs like “Beez In The Trap” by Nicki Minaj and Kanye’s “Mercy” was arrested at LaGuardia for having brass knuckles in his luggage. Chainz (real name: Tauheed Epps) was on his way to a show yesterday in North Carolina when he was reported to the police by TSA and taken in for possession of a criminal weapon. Epps’ people say the knuckles are actually a four-finger ring with the word “dope” on it and that he had no problem flying out of Atlanta with it in his bags. Technically I’d say the terms “brass knuckles” and “four-finger ring” are one in the same, with the latter sounding a little more harmless, BUT if that qualifies as a weapon what doesn’t? If we’re really getting technical, it seems to me that you could just as easily stab someone using a pen, or hit them with a tupperware container full of hair ties. Whatever floats your criminal boat.